I know what you’re thinking. You’re looking for the best airsoft Glock. Maybe it’s your concealed carry weapon. Maybe you’re law enforcement looking for an inexpensive way to practice draw and reloads. Maybe you’re looking to build a realistic loadout for airsoft. An airsoft Glock would complete that kit. If you live in the United States, there are quite a few roadblocks on your way to owning a Glock replica. You may have to make some compromises, though. The short answer, then the long answer. The short answer to your replica Glock woes is that Glock is notoriously possessive with its copyright. What this means to an American customer is you’re not going to find a true airsoft Glock on any store shelf or online inventory. In fact, California-based retailer AirSplat was sued twice over the use of Glock in advertising. Here’s the long answer: in the States, Glock has to show an active interest in maintaining the copyright on their firearms. Part of that is pursuing legal action when they see something that could violate their rights. To maintain the exclusive right to all things Glock in the U.S., the firearms company has to enforce their rights. They have to follow up on copyright infringement claims. 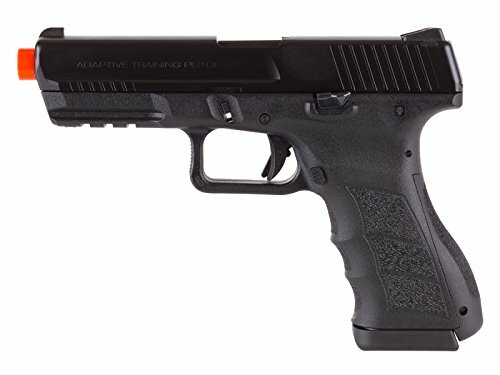 Glock doesn’t want their G-series line watered down by competitors and knock-offs. Anything that looks like a Glock will be attributed to Glock, even if it’s not one of their firearms. If that knock-off malfunctions, it will harm Glock’s reputation. Other countries do not have to respond to copyright violations here. That’s why you’ll find an airsofter with a real airsoft Glock in their holster. They had it imported. So, you still want that airsoft Glock. I don’t blame you! Playing on the same platform you work or train with is an attractive quality. Like I said, though, you’re going to have to make some compromises. There are several Glock-like options available to American airsofters. 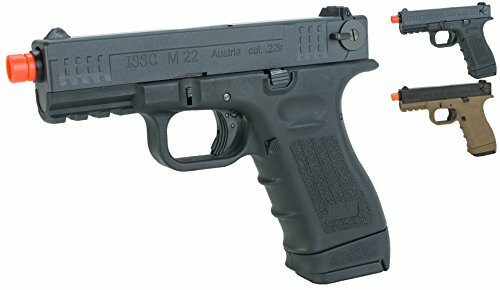 This is the easiest option for a new airsoft Glock. This green gas blowback pistol is a solid option if you’re okay with a Glock-like pistol. 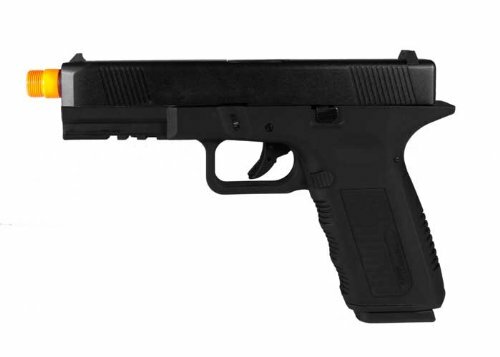 The Echo1 Timberwolf most resembles the Glock 17. It’s muzzle velocity is a nice 300 FPS. It has rails on the frame that will fit airsoft accessories. It may not fit any of your Glock-sized accessories. You will find 26 rounds in its magazine. You’ll also find a 50 round extended magazine if you want to run this gun as a primary. The angle of the polymer pistol grip isn’t like that of a Glock, so it won’t have exactly the same feel. You also get several backplates to replace the stock on. This Glock-like sidearm is also green gas, but with a little more kick. At 340 to 350 FPS, you won’t have to lead your shots as much. It has fewer rounds in the magazine than the Timberwolf at 22 BBs. It also has a railed frame for tactical lights. The ATP is a solid choice if you’re in the market for a Glock look-a-like. The most notable difference with this pistol is it uses CO². It has a 310 FPS muzzle velocity. The problem here is Glock had ISSC do quite a few cosmetic changes to keep it from looking too much like a Glock 17 or 19. It has 25 rounds in its magazine. If owning a Glock-like pistol isn’t good enough for you, your next option is to buy overseas in Asia. You’ll have to do a little searching to find the right online retailer, but they’re out there. And, you’ll have your choice from some of the best airsoft manufacturers out there. I’m talking about Tokyo Marui, a Japanese company. TM makes some of the best airsoft guns you’ll find. WE-Tech of Taiwan also has a number of Glock options. For the record, I have ordered many items overseas and have only had to wait the extra few weeks for the item to arrive. You’ll find many airsoft pistols in the G Series line, like the G17, G18 and the G26. You’ll also find quite a few aftermarket frames and slides from American retailers, so you can make your Glock unique. Be careful, though. You’ll need to let the retailer know you’re from the States. U.S. customs may seize the airsoft pistol because it violates Glock’s copyright. If that’s the case, you may never see your airsoft Glock. It doesn’t happen often, but the risk is there. The overseas retailer should be familiar with the precautions to take to get your product to you. If you need that Glock itch scratched right now, you will have to buy pre-owned. Take to American airsoft forums or other online secondhand sources and roll the dice. Thank you for visiting iamairsoft.com! For great products and more information about the game, check out our Airsoft Buyers Guides and Airsoft U!